Prof. Christian P. Speer, MD, FRCPE is Chairman and Director of the University Children’s Hospital in Würzburg, Germany. He received his MD degree at the University of Göttingen, and completed postgraduate training in the Department of Pediatrics at the University of Göttingen in Germany. 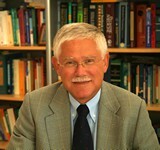 He completed a research fellowship at the National Jewish Hospital and Research Center in Denver, Colorado, USA in 1982-83, and subsequently held appointments at the University of Göttingen (Associate Professor of Pediatrics and Neonatology) and became Professor of Pediatrics and Director of the Department Neonatology, University Children’s Hospital Tübingen in 1994. In 1996 he was elected as Fellow of the Royal College of Physicians (Edin), and in 1999 he became Chairman and Director of the University Children’s Hospital in Würzburg. Prof. Speer’s main areas of research interest include host defense mechanisms in neonates, early detection of neonatal systemic infections, clinical surfactant trials, basic surfactant research and inflammatory mechanisms in acute and chronic lung diseases of preterm infants. He has published more than 300 scientific articles in international and national journals and is author of many book chapters on acute and chronic pulmonary diseases in neonates. In addition, he has edited the textbook “Pädiatrie”, Speer CP, Gahr M (Ed): Springer-Verlag Berlin, Heidelberg, New York, 4th edition 2013, and has been reviewer for many international scientific journals. Prof. Speer has served on the editorial boards for various international journals. He has been invited speaker at numerous congresses and symposia in Europe, North and South America, Asia, Australia, the Middle East and South Africa. In addition, he has served as secretary of the “Working Group on Neonatology” within the “European Society of Pediatric Research” (ESPR), and as board member of the “European Association of Perinatal Medicine” (EAPM). In 2004 he was the “Geoffrey Thorburn Visiting Professor” of the “Perinatal Society of Australia and New Zealand (PSANZ)” and in 2005 he was invited by the Hong Kong Pediatric Society to give the “James Hutchison’s Memorial Lecture 2005”. In addition, he received the “Chiesi Award for Excellence in Neonatology 2006” of the European Association of Perinatal Medicine. 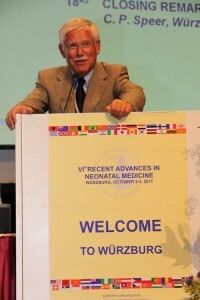 From 2010 – 2012 he was President of the European Association of Perinatal Medicine. In 2013 he was elected as Honorary Member of the American Pediatric Society for his major and internationally recognized contributions to pediatrics, and he became an Honorary Member of the Russian Perinatal Society. In 2014 he was awarded the “Maternité Prize of the European Association of Perinatal Medicine”. Together with Prof. H.L. Halliday, Belfast he is editor-in-chief of Neonatology, formerly Biology of the Neonate, and co-editior of the Zeitschrift für Geburtshilfe und Neonatologie. 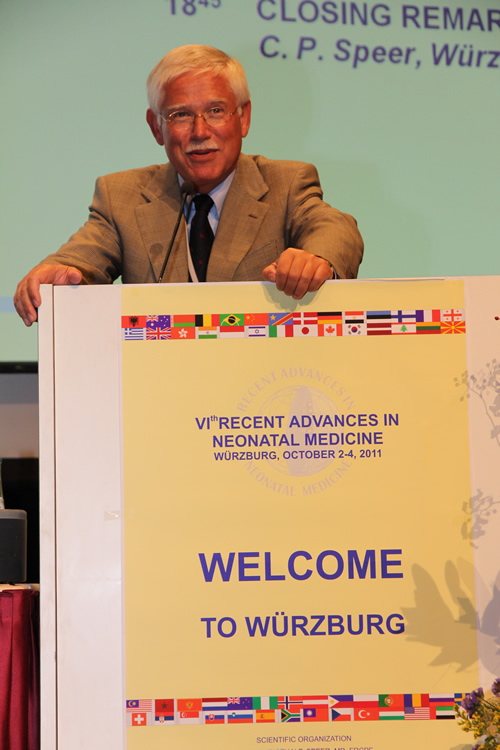 Since 1996 he has regularly organized the international symposium Recent Advances in Neonatal Medicine which has become the largest scientific and educational forum outside the United States of America. In spring 2016, he has organized together with Prof. Bo Sun, Shanghai the first Edition of “The Neonate – An International Symposium für Asia, Shanghai”.